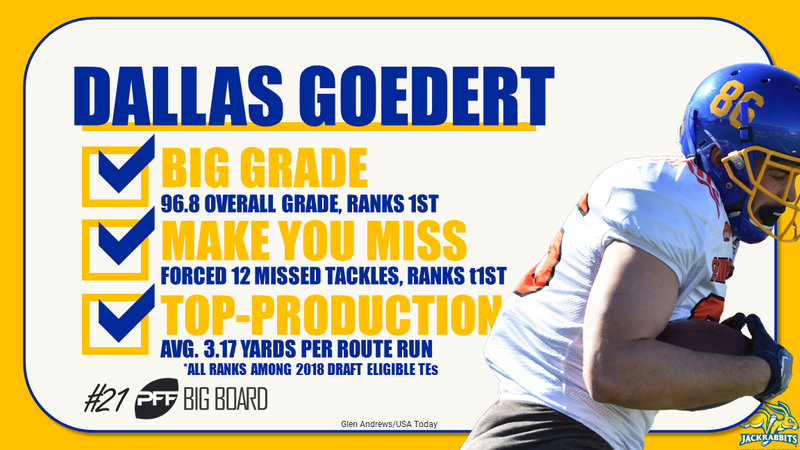 The defending Super Bowl champions added value to their already talent-rich roster with each of their five picks in the 2018 NFL Draft, starting with a PFF favorite in former South Dakota State tight end Dallas Goedert. After trading out of the No. 32 overall pick and into the second round, the Philadelphia Eagles selected Goedert with the No. 49 overall pick, essentially replacing Trey Burton and pairing talented veteran Zach Ertz with an excellent counterpart. The 6-foot-5, 256-pound Goedert, slotted as our top tight end in the class, has a great size-to-athleticism ratio and body control. He earned a class-high 96.8 overall grade and averaged a whopping 3.17 yards per route against FCS competition in 2017. Philadelphia’s two selections after Goedert occurred in the fourth round, where general manager Howie Roseman & Co. selected former Pittsburgh cornerback Avonte Maddox and Florida State edge Josh Sweat with picks Nos. 125 and 130, respectively. At 5-foot-9, 184 pounds, Maddox backs his small stature with a physical style of play in coverage. His mean streak and high-end athleticism will play a key factor in his success at the next level, especially if he adapt to a slot cornerback role that is now void in Philadelphia’s defense with the departure of Patrick Robinson. He’ll have to learn to operate from an inside alignment quite quickly if he’s slotted there, after playing just 40 defensive snaps at slot cornerback over his final two collegiate seasons. Opposite to Maddox, Sweat has the height and length the NFL wants in an edge defender, weighing in at 6-foot-5, 251 pounds. He is explosive off the snap and can beat offensive tackles with just his first step, but his array of pass-rush moves doesn’t expand much further than that. He earned a career-high pass-rush grade (76.8) in 2017, but he’ll need to refine his craft as a pass-rusher to have success at the next level. Roseman rounded out his draft haul with two offensive tackles in Rounds 6 and 7, the latter of which being former Rugby League star Jordan Mailata.